So often, I rush in as the mom to “help” my husband with the kids. Regardless of whether or not he asks for my help. Especially after a deployment, it is so incredibly easy to just jump in and handle any situation with the kids. I’ve been doing it the whole deployment anyway, so why stop now? What I’ve come to realize is that I need to consciously take a step back and let him get back into the groove of being home and handling the kids. Even if it’s bumpy. Even when it’s not how I would do things. Different is just that – different. But it’s not wrong. (You would be correct in assuming that I have tendencies toward perfectionism and controlling behavior.) But, I’m working on perfecting that! I wasted no time after Eric’s homecoming to get out of the house, mostly for my own sanity, but also to give the minions and their dad a chance to reconnect, without my interference – well intentioned though it may be. Sometimes I get it right. Often I jump in and have to back track. And sometimes I get it all messed up. Instead of rushing in to try to soothe Jake, I whispered to Eric (who still felt bad) that perhaps he could offer him a pudding. That way, the dessert came from Daddy and they could work it out between them. Eric’s face lit up, Jacob was more than happy to have a pudding, and all was right with the world once again. I love watching my husband be the hero his is to our kids. Well, not really. It’s just back to work and regular life. We’ve had the best time over the last few days just spending time as a family and reconnecting and getting out and about! The 4th of July was great – celebrated by going to a parade (complete with puking Jacob as he gagged on a candy he didn’t like), a carnival, and of course fireworks. Can’t stop staring at Daddy! We went to our local track (which is by the playground – genius!) so I could run while the minions worked on riding bikes without training wheels with Dad. Jacob rode his bike as if he’d always been riding! He picked it up quick! Hannah will probably need to grow just a bit more to handle balancing, but she’s anxious to learn so I have a feeling it won’t be too long! 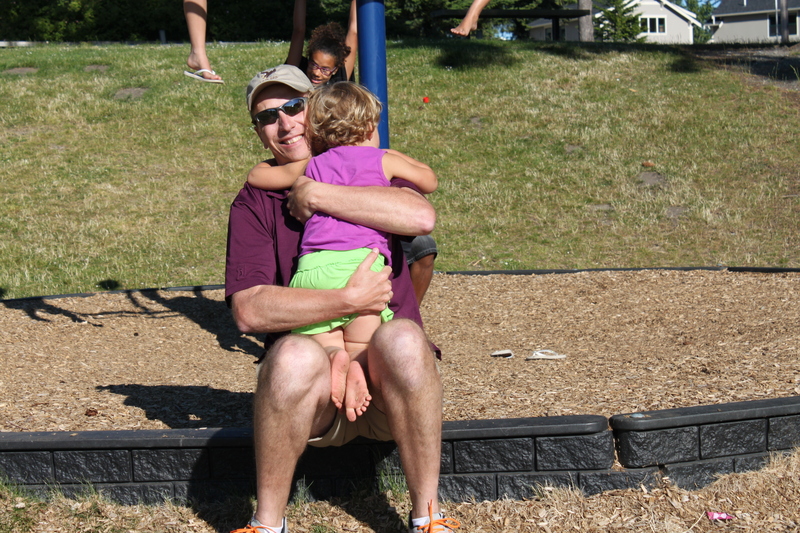 We also ventured up to Lake Padden to run/play with the kids. The trail at the lake is beyond beautiful. Perfect sunny day for a trail run. The kids got to play and swim, I ran and then we all headed to a college baseball game, not that much baseball was watched. There was a bouncy house (which the kids headed straight for, of course) and face painting. My scary minions! This was Hannah’s idea. Other girls were getting all sorts of animals, fairy wings or butterflies. Not Hannah. She went skeleton all the way. Jacob originally wanted to be painted like a dog, but quickly abandoned that for the skeleton look as well. I find it fascinating to contemplate how these two little ones will be as they grow older. These kids are nothing if not fascinated by water! It’s been loads of fun having Daddy home and celebrating. While I like to think the “honeymoon” is never really over – it’s definitely time to get back to a routine! Yes, the big one for our country, but also the one that’s a bit more personal for our family, and for me. I ran my first run yesterday. The first solo-non-stroller-pushing/non-dreadmill trail run in about a year. No races. No bib numbers. No PRs or time clocks. No having to ensure the minions in the stroller are fed (not thirsty, changed, happy, fighting with each other, etc). Only the gravel hitting my gait, the beat of my breath, and the summer sun shining through the trees. I was near tears; breathless and joyful, barely containing myself as other runners passed. I resisted the urge to high-five every single person. (On a couple, I held my hand up in the typical runner’s wave, thinking that if someone felt like it, they could – but sadly, no takers.) It didn’t really matter though. My ear-to-ear grin spelled out exactly how I felt. And so much more. I can’t wait to get out and run today. With all the romance and nostalgia this photo evokes, you might be led to believe we military folk lead extraordinarily dramatic lives. Well, we do. Sort of. For some, the deployments get easier. I don’t agree. The longer we are together, I seem to love him more and in different ways. For me, the deployments get harder. Yes, I know what to expect, and how to rely on myself and get stuff done, but I just like my hubby, I like to hang out with him and cringe at the thought of another chunk of time spent apart. The drama of being separated definitely proves the point that absence makes the heart grow fonder. We miss each other. Desperately. We hang on the phone as long as possible until they have to head back to work, (or sleep as they are into the next day on the other side of the world) or the kids are just making it to0 dang difficult to carry on a coherent conversation. We look forward to emails and calls and Skype conversations and feel lucky to be living in an age where we no longer have to rely on snail mail. But what happens when the deployment is over? We live happily ever after until the next deployment, right? Well, yes, and no. There is that honeymoon period where it’s all romantic and fun and frankly, it does resemble a honeymoon of sorts. As much as we plan and prepare for that perfect homecoming; the outfit, getting “prettied up” with facials, waxes, haircuts, etc., getting the kids’ outfits right, doing all the stuff around the house (mowing the lawn, cleaning the car) so you don’t have to do anything pressing for a little while, the banners on the side of the house that say “Welcome Home” – all of it – it’s great. It’s fun, and a good way to get the kids excited and participating in the homecoming festivities. The anticipation is similar to waiting for Santa at Christmas, and it seems to be amplified each time we go through this process. But more often than not, it seems that despite all the planning – it never quite goes the way I imagine it. He’s jet lagged, tired and/or sick. Gasp! He has ideas of plans HE wants to do. What?! I’ve been making all the decisions for a year! Now I have to check in with someone else?! I’ve vacation/adventure plans for the months after homecoming, he’s made plans too – but they fall on the same days/weeks! The kids interfere with “other” activities! You get the idea. While homecomings are highly emotional, very romantic and dramatic, I’ve found that the fewer expectations I place on the actual event, the better off we all are. Laying low and taking the time to just be with each other as a family is really all we need for a while. The bills, the to-do lists and the summer plans can wait. There will be time for all of that. For now, at homecoming, my “plan” is to just enjoy the moment, let it flow and watch the kids’ faces light up again when they get to see and be with their daddy.